Daniel Loeb’s Third Point released its Q4 2018 Investor Letter at the end of February, in which discussed its several 13F positions, including Campbell Soup Company (NYSE:CPB). If you are interested you can download a copy of the letter – here. Campbell Soup Company was the fund’s new addition during the second quarter of 2018, when the company was facing problems such as – its CEO leaving with no one to take their place, and the company’s earnings taking the wrong course. Daniel Loeb felt the company can resolve its issues, but that it requires changes at the management and the board, which is why he decided to invest in it. We invested in Campbell in the Second Quarter of 2018. The company was at a crossroads. Earnings were going the wrong way, the balance sheet was over-levered, and Campbell’s long-time CEO had just left, with no successor in place. It was clear to us that the company’s problems were fixable,but only with real change at the board and management level. We fought a proxy war to help effect that change and agreed to a settlement in November that should set the stage for Campbell’s turnaround. The terms of our settlement included a mix of board representation (two directors now and one mutually agreeable director later) and formal outside-in engagement (input on the CEO and regular access to the board and C-suite). Once the proxy contest ended, the dynamic between Third Point and the company changed immediately, and we got to work. Within days, two Third Point director nominees, Sarah Hofstetter and Kurt Schmidt, were added to the board. Sarah has critical marketing experience and Kurt brings a wealth of packaged food operational expertise to the Board. We also worked cooperatively with Campbell to help recruit Mark Clouse as its new Chief Executive Officer. Mark is a seasoned packaged food executive and brings the right set of skills to lead the company at this critical time. He started at Campbell on January 22, and we are excited to work with him and the company’s board to repair the balance sheet, execute an operational turnaround of the business, and explore all options to create long-term value for shareholders. With Mark at the helm and change at the board level following years of underperformance, we are confident Campbell has a good long-term case for value creation. Campbell Soup Company is a Camden, New Jersey-based company that produces canned soup and similar dietary products. It has a market cap of $11.33 billion and it sells its products in around 120 countries over the world. Since the beginning of the year, it’s share price gained 16.62%, and on April 2nd, it had a closing price of $37.62. Over the longer period of 12 months precisely, the company’s stock lost almost 14%. At the end of the fourth quarter, a total of 29 of the hedge funds tracked by Insider Monkey were long this stock, same as in one quarter earlier. 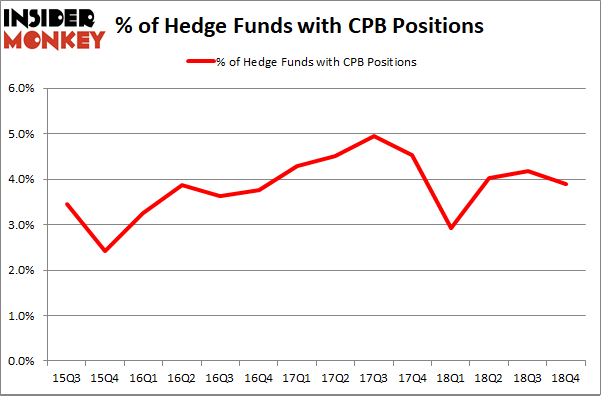 By comparison, 19 hedge funds held shares or bullish call options in CPB a year ago. So, let’s review which hedge funds were among the top holders of the stock and which hedge funds were making big moves. Among these funds, Third Point actually held the most valuable stake in Campbell Soup Company (NYSE:CPB), which was worth $692.8 million at the end of the third quarter. On the second spot was Citadel Investment Group which amassed $30.6 million worth of shares. 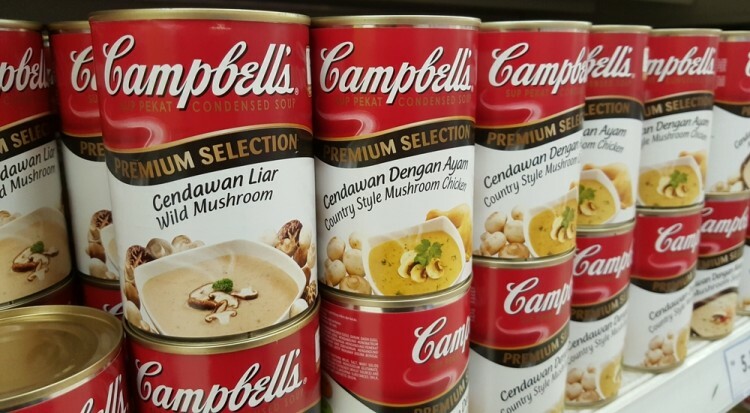 Moreover, D E Shaw, GAMCO Investors, and Point72 Asset Management were also bullish on Campbell Soup Company (NYSE:CPB), allocating a large percentage of their portfolios to this stock. Recently, Campbell Soup Company announced that its Board of Directors affirmed a regular quarterly dividend on its stock of $0.35 per share, which is payable (April 29, 2019) to shareholders of record at the close of business on April 11, 2019. This article was originally published at Insider Monkey. Here’s What Hedge Funds Think About Expeditors International of Washington... Here’s What Hedge Funds Think About Take-Two Interactive Software, Inc... Here’s What Hedge Funds Think About Henry Schein, Inc. (HSIC) Hedge Funds Aren’t Crazy About Cna Financial Corporation (NYSE:CNA) Anymore... Here’s What Hedge Funds Think About Xylem Inc (XYL) Did Hedge Funds Drop The Ball On DISH Network Corp. (DISH) ?